The days of boring debit cards are over. Now you can share your pride and joy every time you use your card. What’s more? You can do it FOR FREE! If you don’t have a photo, then don’t worry. You can upload a picture or pick from one of ours. Just choose from one of the three templates below by clicking on the card you want. Please read and click “I agree” at the bottom of this notice to continue. 3.Use of the Image by SOUTHERN BANCORP will not infringe any other person’s rights, including intellectual property. SOUTHERN BANCORP may, in its discretion, require evidence of the Image owner’s consent or of your ownership of the Image. You (or you have obtained consent from the image’s owner) grant to SOUTHERN BANCORP a perpetual, non-transferable, non-exclusive, royalty-free, world-wide, irrevocable license to use the Image and the data you provide to SOUTHERN BANCORP for the purpose of providing your My PIC Studio debit card. You consent (or have obtained consent from the Image’s owner) to SOUTHERN BANCORP storing, modifying copying or using the Image. You agree to indemnify, defend and hold SOUTHERN BANCORP harmless, its affiliates, its card membership organizations and its and their respective shareholders, officers, directors, employees, agents, members, contractors and representatives from any and all claims, liabilities, losses, costs and expenses of any nature whatever (including, without limitation, attorney’s fees) that may arise from the issuance or use of the My PIC Studio card with your submitted Image on it, including (without limitation) any and all claims alleging trademark or copyright infringement, and/or the violation of a right of privacy or publicity or any other right. 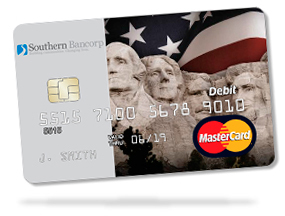 SOUTHERN BANCORP’s liability hereunder is limited to refunding the fee associated with the issuance of the My PIC Studio debit card, and SOUTHERN BANCORP is not liable to you for any loss, damage, claim or expense whatsoever in relation to any action or omission by SOUTHERN BANCORP permitted under these Terms and Conditions. 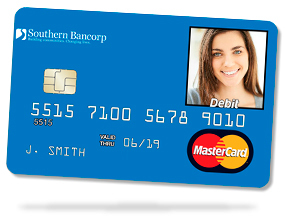 SOUTHERN BANCORP is not responsible for poor quality Images or Images poorly positioned on the My PIC Studio debit card template. Your My PIC Studio debit card remains the property of SOUTHERN BANCORP and you agree to immediately return it or destroy it if asked by SOUTHERN BANCORP for any reason, of if the card or accounts that your My PIC Studio debit card is linked to is closed. 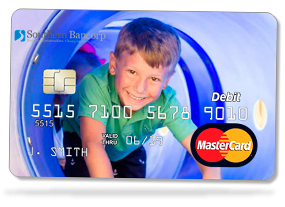 Rejected Images, superceded Images and Images from canceled My PIC Studio debit cards, accepted Images, and copies thereof, may be stored for any period of time, and may be purged at any time that SOUTHERN BANCORP may choose in its sole discretion. If a submitted Image is rejected, the Bank will notify you by e-mail, without any obligation to justify its decision. You will want to be very careful that you submit a photo that meets the Image Guidelines. SOUTHERN BANCORP reserves the right not to accept or use any Image you submit, or to refuse to issue a My PIC Studio debit card, for any reason whatsoever in the Bank’s sole discretion. Use a one of the following file formats: JPEG, PNG, GIF, bitmap, .tif, or TIFF. Ensure the image file is at least 840 x 840 pixels, and no more than 10 MB in size. Own the image or have permission from the owner to use it through proper licensing of the image(s). An image captured with a disposable camera or cell phone does not produce the high quality, high-resolution image required for myPic Studio and cannot be used. 5.Celebrities, athletes, musicians, public figures, etc. 13.Any content that might result in problems at the point of sale or interfere with security features of the card. 14.Any content that might infringe, denigrate, or dilute the payment card brand or its member financial institutions. ATM/Debit Card Fraud Notice: Due to increased fraud and card skimming, Southern occasionally implements security measures that may prevent debit/ATM cards from working in certain high-risk situations and locations without the use of a Personal Identification Number (4 digit PIN). If during an attempted ‘credit’ or signature transaction, your debit card is declined, please try using it again with your 4-digit PIN.